Perhaps you are not quite ready to commit to be a preacher. Many of us need to work past our inhibitions of speaking to strangers and small groups, let alone Become Ordained to Marry. Or you may just feel you need more experience before taking on responsibility to become ordained minister. 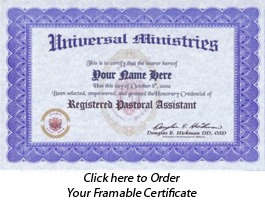 The Universal Ministries offers credentials of lesser standing that may assist you in becoming a better spiritual evangelist. The following credentials are available for those that wish to become ordained to help others find God in your belief. 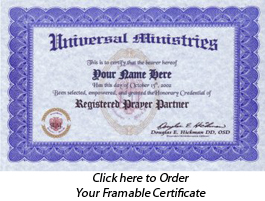 The Registered Prayer Partner is usually not ordained. 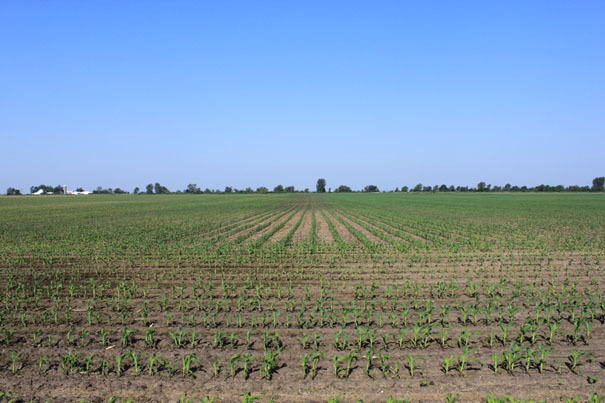 Instead, you are recognized as having the sanctified authority to help others through prayer. As a Registered Prayer Partner, you will offer spiritual guidance and companionship to a small group or individuals. You will often visit shut-ins, hospitals or nursing homes. As a member of the clergy, you will become more comfortable with one of the important functions of the Minister. This will also allow you to develop your own style of prayer guidance and Ministry. This training can be very beneficial not only to the Registered Prayer Partner but to those who are ministered to. You may become a very important in the recipient's life. They often need an emotional lift and a good friend they can rely on. Ultimately, you will become their spiritual leader in many cases. The License to Preach includes previous training as a Registered Prayer Partner and is ideal for the new minister in training. The Evangelical Preacher will gain the ability to perform many of the functions of a full Minister such as leading worship services, study groups and other Church's programs. The Licensed Minister will often be available within a traditional Church to fill in when the Minister is otherwise occupied or away. Becoming a Licensed Preacher is a good way to gain experience before you become ordained to marry or begin your own Ministry. As a Registered Pastoral Assistant you can become a very valuable member of the pastor. Pastoral leadership often begins with following the guidance of the Pastor in various duties to better appreciate the overall duties of ministry and how to be a Pastor. Often this credential will help you to work in a position just below the Pastor as you learn the many ins and outs of becoming the Better Minister.